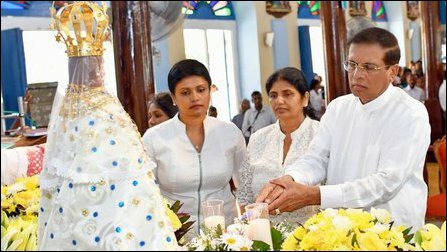 SL President Maithiripala Sirisena and a section of Sinhala Catholics in Colombo are pushing to demarcate the Madu area, where Our Lady of Madu shrine is located. The sinister move is based on the advice coming from the Sinhala Theravada Buddhist establishment, which wants to assert a mythical ‘Pathini Deiyo’ legacy in the next phase through the ‘Anuradhapura’ perception of so-called Sinhala heritage. Sections of Tamil Catholic priests in Mannaar have already sensed the heat in Sinhala establishment in Colombo and advocate caution without much public attention, informed sources in Mannaar told TamilNet. The Sanctity of Madu (Madhu) has always been beyond the scope of the boundary of a non-secular state apparatus and it should remain so also in the future is the general opinion being whispered within the ranks of Mannaar Diocese, the sources further said. The Sinhala establishment, which looks at its heritage through the prism of Anuradhapura and Polonnaruwa in the North Central Province, wants to accomplish the first phase of deceptive transition under cover of declaring it as sacred area during the presidency of Sirisena, who hails from Polonnaruwa district. They talk of ‘Sri Lankanisation’ of Madu, which is the first step. The next step doesn't need explanation. One has to only look at what has happened to the ancient Easwarams of Tamils and the post-2009 Sinhala twist given to mythical Ravana (One of the extremist Sinhala outfits is now named Ravana Balaya). The Holy shrine of Madu already comes under Pilgrimage Ordinance of 1982. As such, it has already got the status of a pan-island pilgrim centre. The administration of Madu Shrine has always been with the Mannaar Diocese. The Sinhala establishment wants to erode this, step-by-step, to become Colombo-centric through effecting a series of deceptive ‘transitions’. The latest ‘Sri Lankanisation’ move on Madu is a nothing else than a premeditated assault on Tamil Christianity. SL President Maithiripala Sirisena and his family visited Madu Shrine along with Archbishop of Colombo His Eminence Malcolm Ranjith, who conducted religious services during the occasion on July 29, 2018. Since then, he has been pushing for the ‘sacred area’ declaration. A series of letters have been exchanged between his secretariat and the Mannaar Diocese on the matter. Tamil Christianity is a concept that had come into being since the time of the birth of Christianity in West Asia. Ancient Tamil Christianity survived in the old Tamil society. Its descendants are the Syrian Christians of Malabar. The origin of the icon of Our Lady of Madu is traced back to the times of the advent of Catholic Christianity in Mannaar in the 15th century. 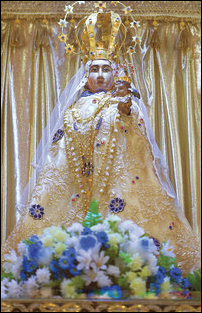 In the 16th century, the image, which was then known as Our Lady of Good Health, was in a church at Maanthai. The persecution of Catholics by the Dutch in the 17th century made her worshippers to carry her deep into Vanni in the year 1670. She was kept at a place Marutha-madu (meaning, the deep tank in the locality of Maruthu / Terminalia arjuna trees), which at that time was in the border of the territories of the king of Kandy. The settlement soon received further Catholic refugees from Jaffna, fleeing Dutch persecutions. A lady among the latter group called Santa Lena (St Helena) built a small church for the statue, which then became Our Lady of Madu. Over the centuries Madu became the most important pilgrim centre for Catholics, both Tamils and Sinhalese, throughout the island. Most of the Sinhala Catholics, who make the pilgrimage to Madu, were Tamils three or four generations ago. They come from the coastal areas of Northwestern and Western Provinces. All along the western coast, up to Colombo, there were traditional villages of Tamil Christians. Their Sinhalicisation was systematic, abetted by an ingenious scheme of disruption of communication. The closing down of the traditional coastal highway between Colombo and Mannaar / Jaffna, in the guise of the Wilpattu sanctuary, cut down the contiguity. What happened in the western coast is the forerunner to what happened and what is happening to the geographical contiguity of Tamils in the East. Through a state-orchestrated process, involving competition for fishing grounds, the third generation became not only Sinhalese but also anti-Tamil. The churches, which until recent times conducted masses in Tamil, switched over entirely to Sinhala, signifying a wedge between Tamil and Sinhala Christianity. 06.03.18 Tamils, Muslims need strategic alliance to counter worsening..
26.12.18 Diocesan Authority over Madu Shrine should remain ..
21.12.18 Sirisena brings ‘sacred area’ deception to subvert..
05.02.18 SL Forest Department grabs agricultural lands of 4..
20.01.18 Occupying Colombo harasses war-affected families i..
19.04.15 SL State agencies, occupying military accelerate S..
27.04.08 SLA occupation of Madu, triggers fears of renewed ..
27.04.08 Mannaar Bishop demands open declaration of Madu as..
09.04.08 Restore peace, sanctity to Madu Church - Jaffna Bi..
08.04.08 A church in Madu destroyed, dreaded stage of ethni..
07.04.08 LTTE urges Norway to take steps to end military as..
07.04.08 All India Catholic Union condemns attack on Madu S..
04.04.08 The temporal and spiritual conquest of Tamils: Mah..
03.04.08 'Sinhala regime transforming holy land into battle..
03.04.08 Our Lady of Madu becomes refugee in her own land: ..
02.04.08 SLA fired shells, rounds hit Madu Shrine premises ..
02.04.08 Thousands march in Mannaar, urge protection for Ma..